A crucial ingredient to the spiritual path, is the importance of detoxing, in order to cleanse internally and open your consciousness so as to allow higher self to infuse more fully. Detoxing is going to make you feel more light, expanded and connected - it feels like coming alive again. If you're not already meditating, or doing it infrequently, meditation needs to become a daily part of our activity. Even if it's challenging to sit in stillness, build up gradually and slowly. Set an alarm for 5minutes and build up until you can sit for 30 minutes without difficulty - which could take a while. Use breath so soften and relax. Don't feel you have to intentionally still the mind. Rather focus on the feelings throughout the body and the mind will still over time. So the mind begins to detox. Once you can do this, then try shorter periods of time spread throughout the day. If you don't already have a practice you're happy with, you could try this Breakthrough Breathing meditation 3 to 4 times daily for 5 minutes (once you know the practice)... Besides meditation, it's vitally important to be careful what you subject your mind to, because it's rather like a sponge. Best not to fill it with junk soap opera vibes from the TV or other news media! So besides meditation, find alternative ways to spend your time - creatively for example through the arts and music. Take up a new creative hobby such as painting or playing a musical instrument. All of this kind of cleansing naturally happens on the Openhand Courses where we're detoxing mind, body and emotions so as to allow the soul to come in more strongly. And when residential on retreat, we're always serving conscious cuisine. You'll find detoxing in these ways brings tremendous benefits to your life. 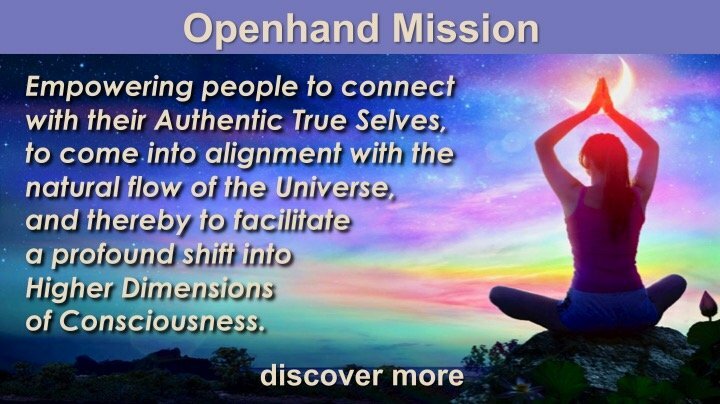 You'll open up more, feel more alive and rejuvenated, and thus the soul will flow more freely, enabling you to make better aligned, higher truth choices. Happy detoxing! Open, thanks for this article full of tips. This past few weeks I have been working to detox and cleanse my physical emotional and mental bodies. I have come across a previous article of yours in which you mention how we can use some crystals to balance our energy field from electrosmog. Since I am living in the city, wifi, electrosmog and phone signals are everywhere! I even had to buy a wifi extender at home! So I thought that in such an environment using crystals makes sense and could prove beneficial. Therefore I made a small research and bought some crystals with protective properties (black tourmaline and hematite). Since I am new to this, I would like to ask whether other people with experience have some knowledge and tips to share regarding the usage of crystals. Also, another question that is in my mind, can the usage of such crystals (especially those that are in continuous contact with the body) have any adverse effects? Yes, black tourmaline (in particular) I know is good at reducing electrosmog. Personally I use Iron Pyrites around plugs. That seems to work well. When talking about the body, I'd say it's personal. Mostly I think in this sense, crystals are most effective in realigning and resonating your core vibe rather than detox, or else bringing new frueqencies through. Do share what you discover with the community - I'm sure plenty would appreciate it. The plan is all written. I notice it happens naturally and periodically twice a year, in autumn and spring, pretty consistently for years, and now I am feeling it again. My way of detoxing the physical body - raw food, then raw fluid food for a couple of weeks, back to raw, lots of water or water with lemon, and move about three hours a day (yoga, dancing and walking) and eh... enemas. Usually it so happens that I have some body therapies or do myself reflexology sessions every day before sleep. Now I am going through some spine and hips alignment and started some skin recovery program (I have some problems), so I basically peel my skin off (quite metaphoric). For the last couple of years I add parasite cleanse and bitter juicing, these are really extraordinary: http://markusrothkranz.com/online-store/bodyforce/parasite-free.html. Don't mind the threatening video, this thing does treat many conditions, just as it is said to, and the feeling is just incredible. I also filter what I own - a lot of throwing away and minimisation going on. I find it is not by chance that in Jewish tradition there is this mikve ritual of purification - immersing the body in water, including the head (not like in shower, but really dipping the whole body into water, like in the sea or bathtub). I noticed it has a very powerful impact, on all levels. So I try to do it at least once a week. This is really timely for me too as I was just thinking recently that this is exactly what I need to do. I just feel like I'm coming down from a whirlwind and wanted to just literally detox! I just painted something recently that came to me from what I can only describe as an ending to a dream I had. I'm sure the image was only maybe 5 seconds of play out, but I felt as if I spent an eon just studying and learning it's texture and color. Funny how crystals are mentioned with this post too. Because I grabbed this huge mahogany obsidian that I have and kept it extremely close to me during the time I drew out the image I saw and then tried to paint it. So black tourmaline for electrosmog huh?! Thats intriguing! I usually just unplug everything. Yet lately Ive noticed even that isn't working so much. So you have a post on this crystals etc here somewhere Open? Links?!! please! I might get lost in all the articles and come up day's later for air LOL!! I admit it, I'm a readaholic. I'm with you Someone on your list of to do's for detox! Especially #2 and #3 and the lemon water I drink constantly! So we've got some company, ha? Yey! "So black tourmaline for electrosmog huh?! Thats intriguing! I usually just unplug everything." Yes, it's essential to unplug appliances when not in use to clear a space of much electrosmog. However, because the average home uses alternating current, there is always a residual electric field in the walls, which creates magnetic energy loops that interfere with your own body chemistry and higher dimensional field. Hence things like Iron Pyrite to help harmonise the field. Another essential tip in this regard, is not to sleep with your head against the wall (which is the norm). Sleep instead with your head pointed toward the centre of the room, away from walls. The use of crytals for energetic cleansing interests me for a while now and through my family i got to know 'angel stones'which a lady in southern Germany produces and which are unbelievably nice for an appartment (link in german). With eyes closed it feels like a huge white bulb of angelic energy, very comforting and enhancing the atmosphere. A mountain crystal placed near the wall which is facing the neighbours flat will give some additional protection. Mostly we are not aware that somebody else mit be sleeping just a meter away from us and we don't notice as there is a wall in between - another point to consider sleeping with your head to the center of the room. I love this! I am in the process of detoxing the physical... I've had all my amalgams replaced apart from one. Apart from being toxic to the body, they magnify wifi. Underwire bras act like an ariel with wifi too. I also use a shungite crystal which soaks up EMF's but must be cleansed once a week as it acts like a sponge soaking it all up but when it's full it will release it all back unless it's cleansed. I also have a clear glass pyramid called phi space.